Ahmed Hassan ‘Koka’ scored on his debut for the Pharaohs in a 3-0 friendly win over the Cranes amid political turmoil in Egypt. Egypt’s friendly game against Uganda was on the brink of being called-off on Wednesday due to the political turmoil in Cairo, but despite security forces being ‘busy with the ongoing situation in the country’ the match kicked-off in El-Gouna in front of 300-odd spectators. Egypt were without a number of Al-Ahly players who are preparing for their CAF Champions League clash at Congo’s Leopards this weekend. 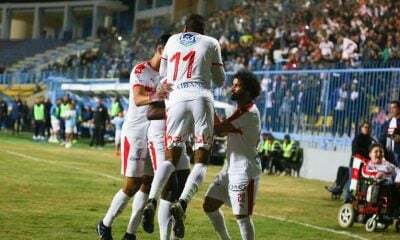 Only suspended duo Ahmed Fathi and Hossam Ashour, and substitute goalkeeper Mossad Awad were allowed to join Bradley’s squad, with the former captaining the Pharaohs against the Cranes. Hull City right wing-back Ahmed Elmohamady was also withdrawn from Bob Bradley’s squad with bruised ribs. Rio Ave’s 20-year-old hitman Ahmed Hassan ‘Koka’ scored the opening goal on his debut for the Pharaohs after 22 minutes, just a minute after Uganda goalkeeper Odongkara denied his header from point-blank range. Egypt U-20 trio Ahmed Refaat, Ahmed Samir and goalkeeper Mosaad Awad also made their senior debut for the Pharaohs after coming on as second-half substitutes. FC Basel winger and Egypt’s top scorer in World Cup qualifying Mohamed Salah, 21, who wasted several scoring chances in the first half, doubled the score in the 57th minute with a low drive past substitute keeper Denis Onayngo, his 16th international goal. Ibrahim Salah scored Egypt’s third goal with a well taken header off a corner seven minutes from full-time. Unfortunately this friendly win against Uganda, who are ranked 77th in FIFA Rankings, won’t earn a significant number of points for Egypt, as the Pharaohs seek to pass Tunisia to clinch the final spot in Pot 1 in the final round of World Cup qualifying. Note: Since the match was not broadcast due to the turmoil in Egypt, there was confusion over the Pharaohs’ third goalscorer. Sources claimed Adam El-Abd scored the final goal, but Brighton & Hove AFC later denied this. The match wasn’t broadcast, so highly unlikely highlights will be available.